The burning pile of scrap metal on a Schnitzer Steel barge in Surrey spewed dark smoke into the air on Tuesday. The company that owns the barge that caught fire on the Fraser River says it doesn't know how the fire started. Schnitzer Steel also told CBC News it doesn't believe air or water quality was adversely impacted by the blaze. On Tuesday, a massive pile of junked cars ignited, spewing thick black smoke throughout much of Metro Vancouver. 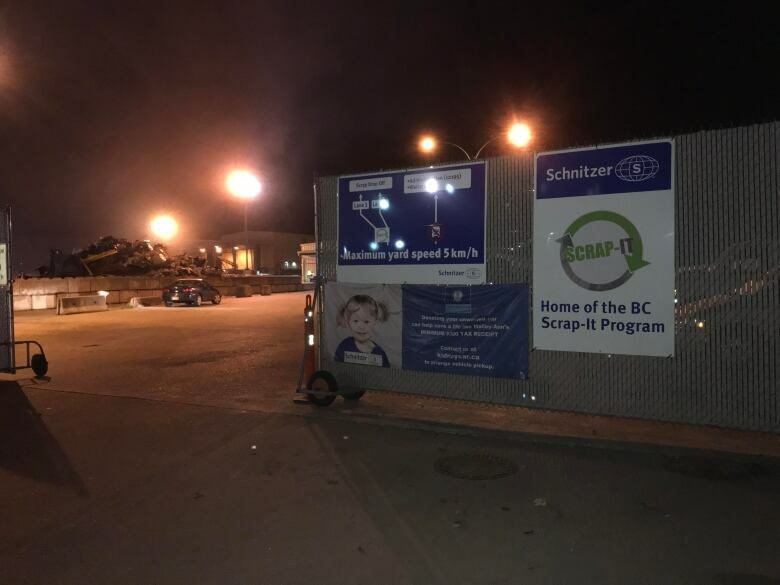 It was the second time in two months that an inferno has broken out on a Schnitzer barge at the Surrey location. "Schnitzer is reviewing yesterday's events in an effort to determine the cause of the fire and will make any necessary adjustments to policies or procedures to reduce risk in the future as needed," said Tony Belot, Schnitzer's government and public affairs manager in an emailed statement. Asst. Fire Chief Chris Keon with Surrey Fire Services said the fire was first reported shortly before 5 p.m. PT at the Schnitzer facility just east of the Patullo Bridge. According to the company, the fire was extinguished eight hours later. There were no injuries and no one was on the barge at the time of the fire. In addition to Surrey crews, crews with the Port of Vancouver and the Coast Guard also responded to the fire, along with a fireboat from Vancouver Fire and Rescue. The cause of the first Schnitzer barge fire in early August. remains a mystery. That fire triggered an air quality warning for Metro Vancouver. Keon had no comment regarding the cause of Tuesday's fire or the rarity of barge fires in the region. "It's definitely concerning," said Lynn Slater, a server at the Brownsville Pub, about a kilometre away from the Schnitzer yard. Slater sounded exasperated as she described the plume of thick smoke that blew into North Surrey. "We've never had barge fires before," she said. Belot said Schnitzer said it is cooperating with all applicable agencies, including environmental agencies.